Police and Crime Panels must refer any complaints made about conduct by a Police and Crime Commissioner which constitutes or involves, or appears to constitute or involve, the commission of a criminal offence to the Independent Police Complaints Commission (IPCC). The IPCC has recently revealed, in response to a Freedom of Information request I made, that there have been 25 such referrals to-date. In 20 of those cases the IPCC have decide not to carry out an investigation themselves but have returned the complaint to the Police and Crime Panel. The IPCC has refused to release any information on these 20 cases they have decided to return to the Police and Crime Panels; they are not publicly explaining the reasons for their decision not to carry out investigations themselves in these cases. While it may be that information on those complaints is available via meeting papers published on the relevant Police and Crime Panel websites I think it would be helpful if the IPCC published information about those complaints, and the IPCC’s decision not to investigate them themselves, so they are being transparent and accountable. The IPCC does publish information on complaints it has decided to investigate. I think it is inconsistent of the IPCC to publish details of complaints they are investigating (or have concluded investigating) but to refuse to release or publish any information relating to other complaints. The IPCC refused to release information they hold on such other complaints against Police and Crime Commissioners citing the personal information exemption from the Freedom of Information Act. Presumably there is correspondence from the IPCC to the relevant Police and Crime Panel in each of these cases explaining the decision; this could simply be published by the IPCC. One reason I made my FoI request to the IPCC for information on complaints against Police and Crime Commissioners was to seek to discover if the information on complaints against Police and Crime Commissioners published on the IPCC website is comprehensive. The response shows there is information on the IPCC website about all four complaints that have resulted in independent investigations by the IPCC. However the IPCC website hasn’t “tagged” their page on the investigation into Clive Grunshaw, or some other relevant material “PCC” so it does not appear on their webpage on PCCs, or what that page suggests ought be a list of IPCC investigations relating to PCCs. While information on all four investigations is on the IPCC website; the page on PCCs is not comprehensive and there is no indication there is material omitted. There is no requirement for Police and Crime Panels to deal with complaints in an open and transparent manner, and they may consider complaints in closed sessions. 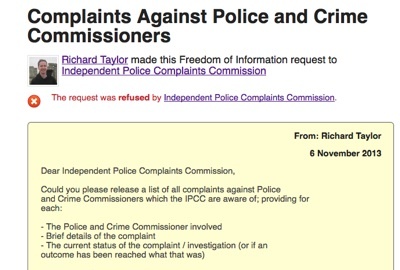 The IPCC’s FOI response confirms information is held on “The current status of the complaint / investigation (or if an outcome has been reached what that was)” in respect of all 58 complaints against Police and Crime Commissioners however it is refusing to release that information in respect of all but 4 complaints. I can see that the IPCC proactively publishing details of complaints which should have been made to, and dealt with by, a Police and Crime Panel without referral to the IPCC, might not be appropriate as they would not be aware of all of such complaints. I do though think the IPCC ought monitor, and publish information on, how all those complaints which have been referred to them by Police and Crime Panels have been dealt with. A further reason behind my request to the IPCC for information on complaints against Police and Crime Commissioners was to seek to monitor how Police and Crime Panels, including my own in Cambridgeshire, is working. At the last meeting of the Cambridgeshire Police and Crime Panel concern was expressed about the panel’s ability to rapidly pass details of complaints to the IPCC. The IPCC’s refusal to release all but statistical data, which isn’t specific to particular policing areas means I cannot find out about any complaints relating to my own Police and Crime Commissioner which may have been referred to, or made to, the IPCC, all I’ve been able to find our is that there are none the IPCC has decided to investigate. All correspondence relating to my request has been published in full via the WhatDoTheyKnow website. The IPCC confirmed they hold the information requested but have refused to release it citing the personal information exemption from the Freedom of Information Act. The IPCC is aware of 58 complaints made about 31 of the Police and Crime Commissioners. 1 relates to a referral where the mode of investigation is still being considered. The requirement for Police and Crime Panels to refer serious complaints to the IPCC comes from Regulation 13 of the The Elected Local Policing Bodies (Complaints and Misconduct) Regulations 2012 which uses the definition of a “serious complaint” from Schedule 7 of the Police Reform and Social Responsibility Act 2011. This entry was posted on January 4, 2014 by Richard Taylor. Interestingly Richard, the Beds PCC was referred to the IPCC by his chief constable – this has since been referred back to the Bedfordshire Police and Crime Panel. It relates to inappropriate disclosure of Police Information by the PCC. The panel have called a meeting for the PCC to attend to explain which is next Tuesday 14 January (see http://www.councillorsupport.bedford.gov.uk/ieListDocuments.aspx?CId=561&MId=3622&Ver=4). The agenda published does not include much detail, but it does include a preceding item where the likelihood is that the Police & Crime Panel will go into a closed session to discuss what the PCC has done (or not done). I note the panel meeting doesn’t have its usual “Questions from Members of the Constituent Councils and members of the public” agenda item which would allow councillors or members of the public to ask what is going on and to request as much information as possible be placed into the public domain. Will the panel be returning to public session once they have completed their deliberations? The Police and Crime Panel meeting papers ought be a source of reliable information for those wishing to verify the press reports. Very helpful information, I have submitted a complaint regarding Adam Simmonds PCC for Northamptonshire regarding misconduct in public office, in relation to his plans for the sale of Wootton Hall, our current Police FHQ. It is the same old crap. The IPCC are protecting their friends in high places. They all piss in the same pot. Vera Baird, QC, Northumbria PCC is refusing to even look in to very serious allegations of criminal corruption within Northumbria police. Vera Baird is in fact ignoring the subject matter (the Martin McGartland cases) and in doing so she herself is turning a blind-eye to such serious corruption. All this even when there is very compelling evidence in the Martin McGartland case against corrupt Northumbria police Top Cops. A spokesman for the IPCC told the Times that between the 2012 elections and October 31 it had received 44 complaints about 23 PCCs. The greater coverage for this is positive; but the numbers appear inconsistent with those released to me in January. I suspect, given the text of the article, this is wrong, and the subheading writer has wrongly, but reasonably, assumed the IPCC investigates all complaints reported to it. The article also misses the role of Police and Crime Panels.